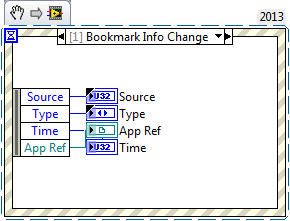 One of the exciting new features of LabVIEW 2013 was the introduction of bookmarks. Bookmarks are a special tagging mechanism that can be added to a VI Block Diagram. Any text that starts with a hashtag ( # ) will automatically be identified by LabVIEW as a bookmark. These can be used for marking to-do items or unfinished tasks in different parts of code. 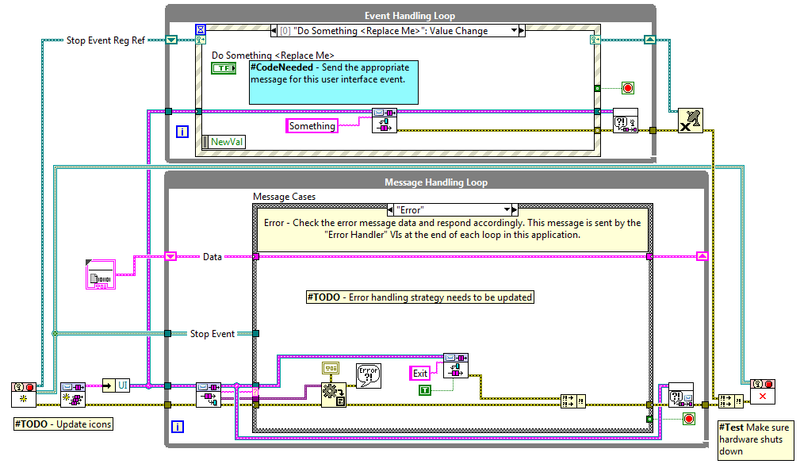 When you add a hashtag to a block diagram comment, LabVIEW detects a bookmark and bolds the bookmark tag to distinguish it from the rest of the text, (for example: "#TODO revise algorithm") . What is the LabVIEW Bookmark Manager? The Bookmark Manager is a tool for viewing all bookmarks in a project or application instance. It can be accessed from the View > Bookmark Manager menu item. When you open the built-in Bookmark Manager, it shows the bookmark and any comments that follow it. You can also double click any bookmark entry and it will open the VI where it exists and highlight the location on the block diagram. From the bookmark manager, you can also change the project in which you are viewing bookmarks and change the view. The LabVIEW Bookmark Manager is very simple and useful, but its true power comes from its customizability. The bookmark API has a fully open interface which can be used to create your own custom bookmark manager. You can even copy and edit the built in manager to help get you started since the Bookmark Manager is also open and unlocked. The Get VI Bookmarks method will return all the bookmarks associated with a certain VI. This method uses a VI reference and works for all VIs in memory, including those that have not been saved to disk. The Get VI: Bookmarks method is similar to the Get VI Bookmarks VI Method, except it is a method for the Application class. This method uses a VI Path for input and works for any VI on disk, even if they have not been loaded into memory. Note: Bookmarks are stored as a VI resource on disk but are kept up to date in memory. This means that a VI does not have to be in LabVIEW's memory in order to read its bookmarks. This method will convert a bookmark ID to an object reference. 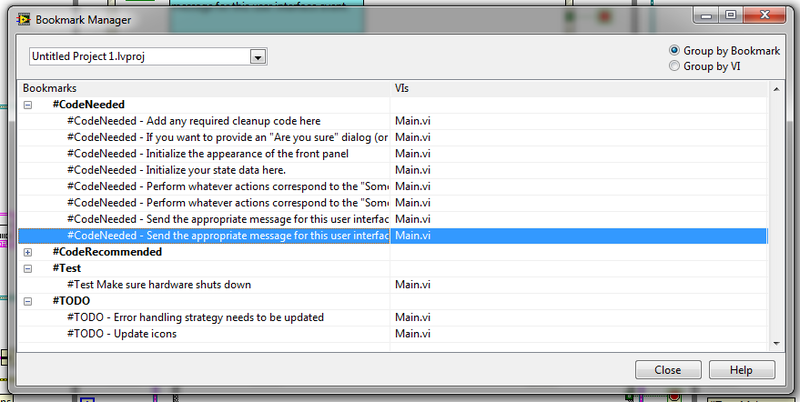 Note: Bookmarks are referenced by "Bookmark IDs" because Object References are only valid for VI's loaded in memory. 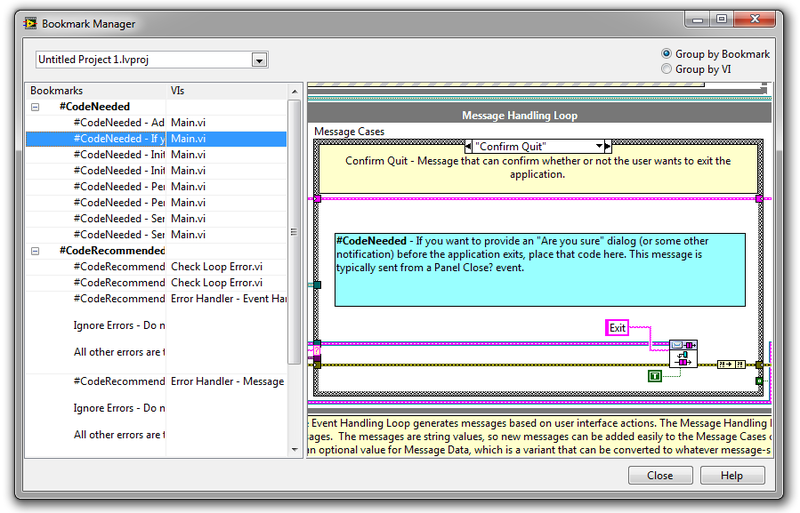 This is an application event that is generated when a user changes the bookmark of a VI. This can be handled in a LabVIEW Event Structure. Copy the Default folder found in the labview\resource\dialog\BookmarkManager\managers directory. You will use this source as the starting point for developing your bookmark manager. Paste the folder in the same directory and rename it to something else. Copy the Default.txt file at the top level of the managers directory and rename it to match the new name of the folder from step 2. 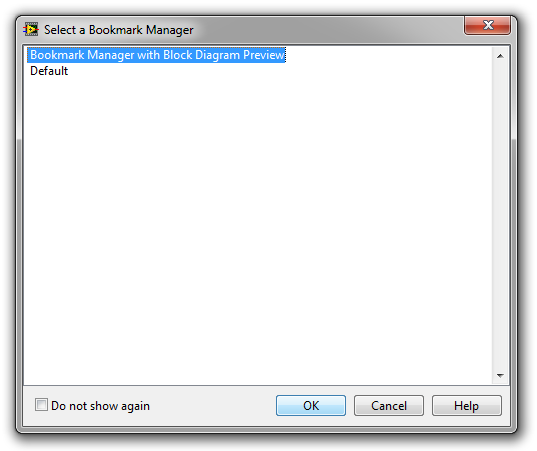 Open the copy of the *.txt file and replace the word Default with the name of your new bookmark manager (this name will appear in the "Select a Bookmark Manager" dialog). Edit the files in the new folder to accommodate your particular needs. 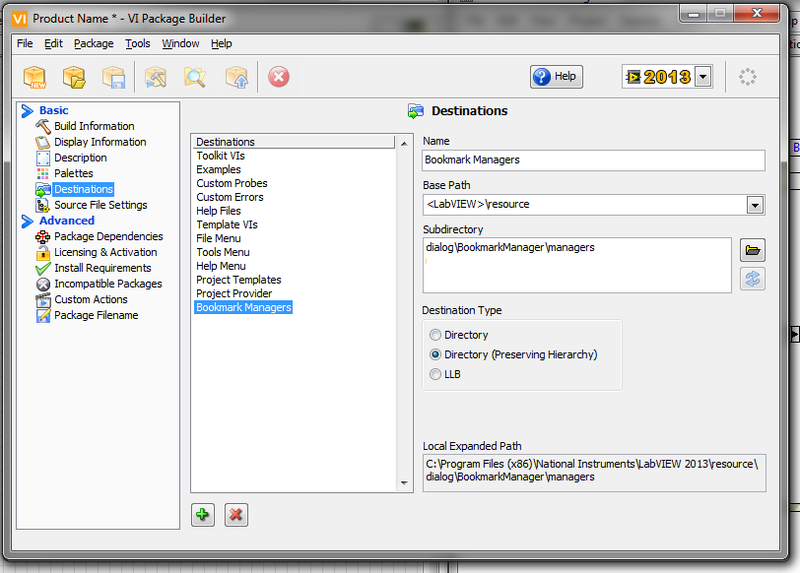 Once you have multiple Bookmark Manager's located in the labview\resource\dialog\BookmarkManager\managers directory, LabVIEW will allow you to select between them when you choose to launch this from the View menu. You may choose not to show this selection dialog, but anytime a new bookmark manager is found it will prompt again allowing you to change to the new one. When copying the Default Bookmark manager, make sure to watch out for cross-linking of files between the new folder and existing "Default" folder. After initially copying the folder, you should make sure to check that all files in the new project point to the files in the new folder. Once this is fully working once, it is also recommended to rename the project and project libraries in order to prevent future cross-linking. Copy the default bookmark manager instead of modifying the original. This will allow you to revert to the built-in bookmark manager in case anything goes wrong. When testing your bookmark manager, make sure to completely save and close the VIs and projects before running the bookmark manager from the View menu. Also, if you need to use breakpoints or highlight execution in your code, make sure to close the running VI and re-open the project before modifying any code. The reason for this is that LabVIEW puts the Bookmark Manager Dialog VI in a state when run from the Tools menu called a System VI. On exit, the VI is reverted to an editable state. However if you stop the Bookmark from running part way through execution, the VI will remain in this state permanently and may cause unexpected behavior. A System VI will not show any errors in the "Error List" window if they are broken and System VIs do not appear in the Hierarchy window. If you accidentally get your VI stuck in the "System VI" state, you can use the attached "Is System VI Write" VI to unset your VI as a system VI. If you think other users in the world would benefit from your new Bookmark Manager, consider submitting it to the LabVIEW Tools Network as either a free download or a paid product. More information on how to submit can be found at Contribute a LabVIEW Add-On to the Tools Network.